We have been concentrating on myths in our reading/writing (to connect to the Native American unit we just wrapped up) and I wanted to share a few things we did with you. 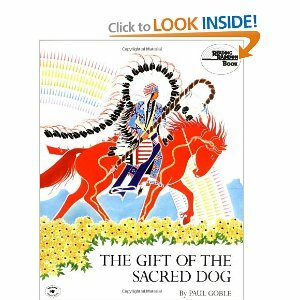 First, we read The Gift of the Sacred Dog (Reading Rainbow Book) , which is a myth to tell how the Native peoples were gifted the horse. It really was a great myth to read because it is pretty typical of all myths. We were able to really see all of the major elements found within myths. We then created a simple "door" foldable (I have no idea if that is what it is called...it is just what I called it) with all of the major traits of a myth on it. The students looked through The Gift of the Sacred Dog (Reading Rainbow Book) and picked out examples of all the major mythical traits. Next, students were given their own myths to read. In partners, they read them aloud (to work on fluency) and then picked out the major mythical traits as well. This information went on the bottom portion of the foldable so the students had a side by side comparison of the two myths. As a class, we put all the information together on a big class chart (which, of course, I did NOT take a picture of!) Doing this allowed the students to see just how universal these mythological traits were and how they could be found in one way or another within the myths. They also saw that not all of the myths had every.single trait, and that was ok too. Next, I wanted the students to transfer this knowledge into writing their own myths. The students went outside and we listened, looked, felt, and smelled nature. They then wrote all of their observations down in a circle map. Once that was done, the kids thought of one observation they wanted to "explain". It could have been why black widows have spots or why trees are rooted in the ground and can't move. We went over and over how these myths were not to be the scientific explanation, but a creative explanation that happened long ago and involved nature. After their question was chosen, the students created an answer. They had enough exposure to myths at this point to understand that I wanted them to have a creative answer that would then be explained throughout the story the were going to write. Since they knew where they were going to start, and where they wanted to finish, I asked them to fill in this myth trait chart with all of the elements they thought they would want to include. This was more of a brainstorm sheet, so if they ended up not using the ideas, that was ok. I just wanted them to begin to think about what supernatural elements, or whatnot they might include. Next, came the rough draft, followed by numerous peer revision sessions, and finally a final draft. Overall, these came out good. They seemed to get the point of the myth and how it is used in traditional cultures (which was the point of it all) and I am pleased with that. What are you working on in your reading/writing block? My coworker did something like this, but I wasn't brave enough to try it with three sections of kids :) I love the planning template, though. I might attempt it next year! Love this! What a great way to apply reading to writing. The Gift of the Sacred Dog is one of my favorites. I had never read it before this unit, and really enjoyed it too! This is such a great idea! It is perfect for addressing the 4th grade core standard for Reading: Literature. . . "Determine the meaning of words and phrases as they are used in a text, including those that allude to significant characters found in mythology (e.g., Herculean)." I am new to 4th grade and this standard was one that I was unsure of how to "tackle" it. This would definitely work in my classroom! That sounds so cool! Very innovative! I love your blog. I'm your newest follower. I love this! We are starting legends next week in our writing class, so I'm definitely going to try this! This is such a great idea. Thank you for sharing the whole process. It is a great thinking activity. I will be using this idea as well when we study Greece. That is really a wonderful idea, i really appreciate your way of thinking.thank you for sharing it, Sponsor a child who is really needy, so that he will also be able to enjoy this tyoe of study activity.